On the back of the LNWR print is written 'Llanfairfechan 1902. Name of engine unknown (John Hick class)'. Another print in the same batch has 'RB' on the back, believed to be the photographer, Robert Brookman. So what is the train, where exactly is it, what is the meaning of the white(?) board at the foot of the chimney and finally who was Robert Brookman? According to photos in J.E. Kite's two books (Vintage Album 1850-1925 and Vintage Steam), Robert Brookman was taking railway photographs by 1900, and continued until at least 1909. His subjects included trains on the MR, GCR and L&Y. Apart from that, all I know is that he lived at North Finchley in 1942, had moved to Southend-on-Sea by 1953, and was alive in 1966. The location would appear to be east of Llanfairfechan Station where the north Wales main line runs between the northern slopes of Penmaen Mawr and the foreshore - the train would be west bound and approaching Llanfairfechan Station. The caption is correct. 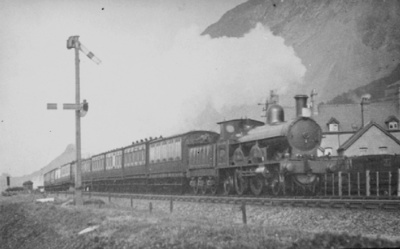 The locomotive is approaching Llanfairfechan Station having just left the viaduct below the mountain of Penmaenmawr, which at the time of the photograph (1902), and still so to-day, supplied quarried stone for the 'track-bed' of the Premier Lines of the LNWR. I am no expert on the carriages, but if this would help the train must be a morning one, as the sun is shining through the spectacle glass on the cab onto the boiler wrapper. The sun rises at about 1 o'clock, that is, top right of the picture above the mountain, and the sun sets beyond the Island of Anglesey which is facing the train across the Menai Straits, about where the photographer would be standing. There is a collection at the NRM referred to by the following A2A catalogue entry: Robert Brookman collection of railway photographs [1889-1932] - ref. The Brookman Collection. Presumably there is more information and photos to be found at that establishment. It has been suggested that Brookman was a pupil at Harrow School and was perhaps encouraged in his photography by a teacher whose name was Carr and whose hobby was railway photography. In resposne to my letter to Harrow School asking for any information about these two, the librarian kindly phoned me and said that their records, which go back to 1571, show that no one by the name of Brookman has ever been a pupil at the school and no one by the name of Carr has ever taught there. Any more ideas welcome! The photo shows a train on the Down line just before Llanfairfechan station. It also shows the end of the sidings on the left.